When looking for the perfect classifieds theme, it’s important to consider what you’re trying to ultimately achieve. Most of the time you’re interested in making money. Others are more focused on creating a service that helps out their local economy. Either way, classifieds are bound to get the word out about businesses in a certain area, but it’s not always affordable to get up and running from the start. How To Start a Classifieds Website on a Budget? That’s why we recommend going with a free WordPress classifieds theme. They don’t cost you any money upfront, and you can save on the expenses you would generally spend when hiring a developer to make your website from scratch. In addition, WordPress themes built specifically for classifieds have certain modules for ads, collecting payments and organizing the classifieds in a reasonable manner. How to Find Quality Free Theme? Since so many classified themes are scattered throughout the internet, it’s difficult to understand which of them are worth your time. For example, some of the free themes may not have solid coding, making it so that your site starts to clash with plugins and slow down over time. This is exactly what you want to avoid, so we did the work for you and listed several classified themes that have lightweight designs, reputable developers, and clean interfaces. You may be interested in making a classifieds website for a certain niche, or maybe you’re trying to expand your reach to the entire world. Regardless, bookmark the list below to check back on updates and to locate the ideal options for you right now. 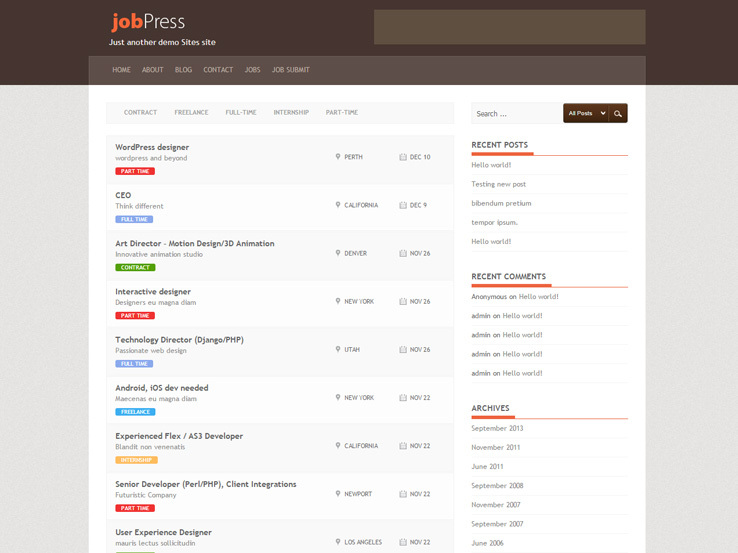 The jobPress WordPress theme comes from the folks at FabThemes and it helps you setup a classifieds job board for free. Users can land on your site to submit a job listing, all with the help of a beautifully designed form. The custom menus and custom post types are ideal for adding some variety to your layout, while the widgetized sidebar converts your design area into somewhat of a drag-and-drop interface. Two custom widgets can be implemented on the site, and an ad banner at the top of the theme allows you to bring in additional money through your website. Upload your logo from the backend and try changing the colors to reach your branding needs. Each of the classified ads is listed on the homepage, with information about the location, time, and type of listing. You can use the widgets in the sidebar for showing off recent comments, recent posts, and even sponsors. Users can try out the search bar to locate certain classified ads that relate to them and admins can even use this to find certain parts of their website in a few seconds. The jobs list is available through the custom menu and you can even have a large Job Submit button towards the top of your site. Jobs and blog posts can be filtered from the search bar and you’ll notice that the blog posts are nicely formatted to show search engines that your site is worth moving up in the rankings. Not to mention that blog posts on a classifieds site serve as a great resource for your readers. You can integrate a contact form into one of the pages, which helps out with keeping in touch with your customers and receiving requests from companies that would like to post certain listings. Overall, the jobPress WordPress theme is one of the simplest free options you can choose from, so give it a try. After all, it’s completely free! 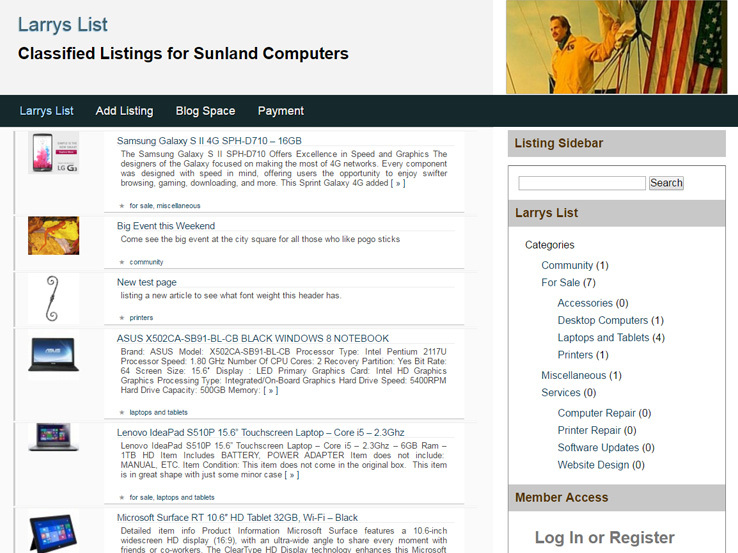 The Larrys List theme makes your website look somewhat like Craigslist or Angie’s List, with a large feed of your most recent listings and various widgets on the right to assist with categorization and filtering. You shouldn’t expect much in terms of a complex design, but that often works to your advantage considering most people are simply coming to these classified sites to locate items or jobs. They don’t really care about the way the website looks. The theme is built on a completely responsive framework and looks great even on mobile devices. You can expect quite the response from this layout, considering many people are going to try to buy items through the site on mobile phones and tablets. The main page is a hub for latest listings. If someone fails to sell an item in the first week or so, they can go back into their profile and try to post again. Once again, this works similar to Craigslist in that respect. A custom background is possible for the ultimate branding and the translation-ready features mean that people from other countries can come to your site and still understand what the classifieds are saying. Email and social media links are included with the Larrys List theme, allowing you to keep in contact with the people who are posting listings on your site. The posters have a chance to view their listing stats, all from the comfort of their own little dashboard. If someone lands on your site and wants to create a listing, it only takes a few moments to add all of the information. Images are supported and they can type in descriptions and where to get a hold of them. As stated before, if you’re looking for a solution that somewhat mimics the structure of Craigslist, this is a solid choice for you. You shouldn’t expect much in terms of custom design, but the structure is there to help you out. The Jobeleon WordPress theme is yet another job board classifieds theme and it offers a modern, flat design to connect with those who are interested in using a site with a solid user interface. For a free theme, this is a quality choice for people who don’t want to be left behind in terms of design trends. The amazing full-width map template gives users a chance to see where jobs are hiring, which comes into play for both job seekers and employers. You’re not going to want a job that’s half way across the world, so it’s best to filter based on the options that are located around you. The customizable colors are all handled on the backend of your WordPress site, allowing you to structure what people see on the front end, using colors that you usually wouldn’t receive with a free theme. The responsive design is helpful for those who want to search for jobs on a mobile device, while the job board area holds up well against many of the premium solutions on the market. Both job seekers and posters get their own personalized dashboards for managing resumes and organizing candidates. Two large buttons are located towards the top of the site: one for posting a job and another for finding a job. After that, users have the ability to search for a certain job or filter based on certain criteria. The job types are broken down into several categories, including freelance, full-time, part-time and internship. Tons of widgets are available for your use. We like the email subscription form for keeping people updated on new listings, along with recent job listings. It’s also nice because job seekers have a button to look at all of the companies that are active on your site. They can easily focus on one company and opt to receive only listings from them. 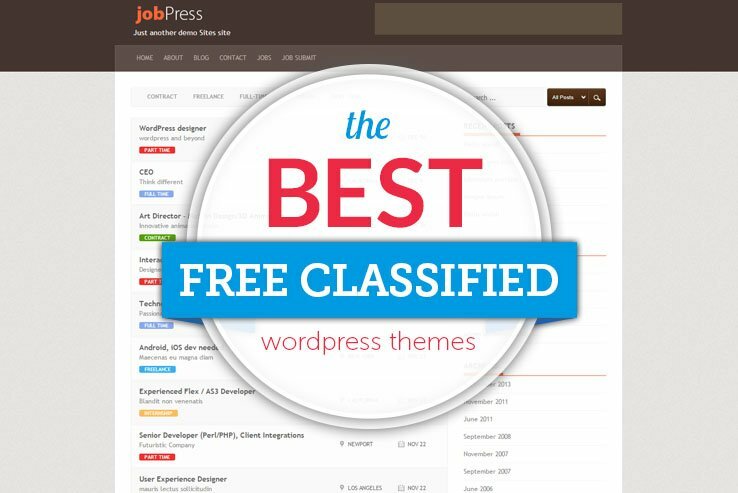 Along with a general application, an RSS feed, and various other cool modules, the Jobeleon WordPress theme is one of the more modern classified options on this list. The Viper WordPress theme is another choice from FabThemes and it comes with stylish product listings and a custom homepage template. Use the offer banners and sliders for some of the more popular listings and even change the number of slides in the header for a constant presentation of the coolest stuff. This is primarily built to showcase products that people list, but there’s no reason you couldn’t use it for services or even jobs. The reviews are rather positive and the homepage highlights tons of products with pricing, details, images, and more. Users can search by department. This is especially handy if you have some categories like shoes, watches or cameras. A footer is available for implementing widgets with recent posts, comments, and categories, and the product modules have Buy Now buttons for quick transactions. Connect the Purchase Now button with the payment processor of your choice and even link to other sites like eBay and Craigslist. 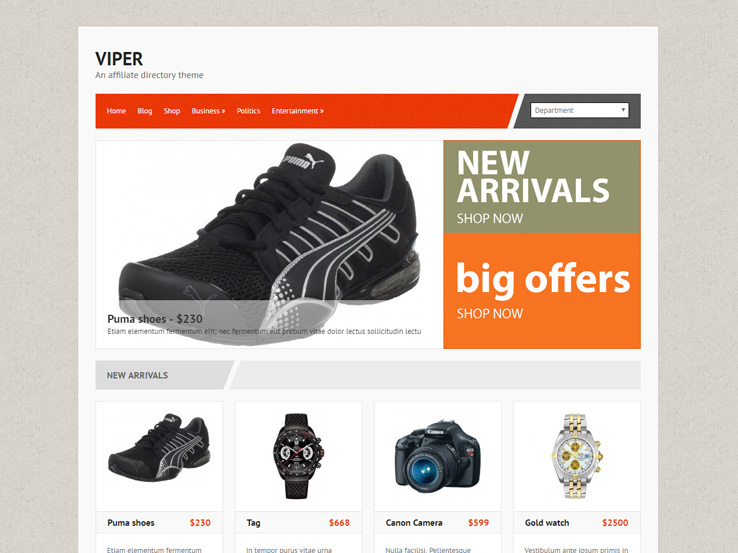 The overall design of the Viper WordPress theme is simple and to the point. Your users will have no problem locating items and the backend is nice for managing a professional layout, regardless of how many people you plan on having in your organization. Gears is another high-quality theme from FabThemes. 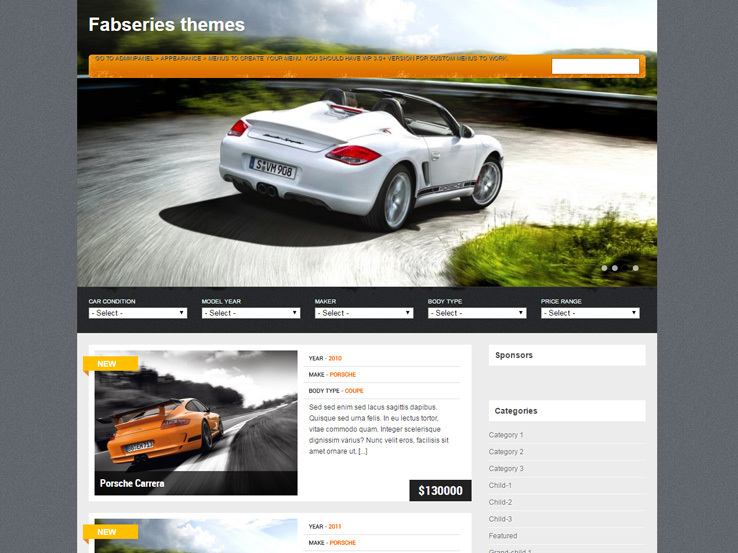 The theme is built to showcase auto listings specifically, but it also has plenty of features and an attractive design. The homepage features a large slider which allows you display your best listings. You can put your contact information right at the top so people have an easy time finding you. Below the slider, your visitors can make use of the filtering options to find the exact model they’re looking for. You can filter by the car maker, model year, body type, car condition, and price. The individual listing displays a large image of a particular car with all the pertinent information displayed underneath. You can add a detailed description in the body of the post and provide potential buyers with even more information. Gears theme comes with a powerful theme options panel which allows you to customize any aspect of the theme to get the look and feel you want. What’s more, you can also display ads from various ad networks in your sidebar, giving you a nice way to monetize your site. 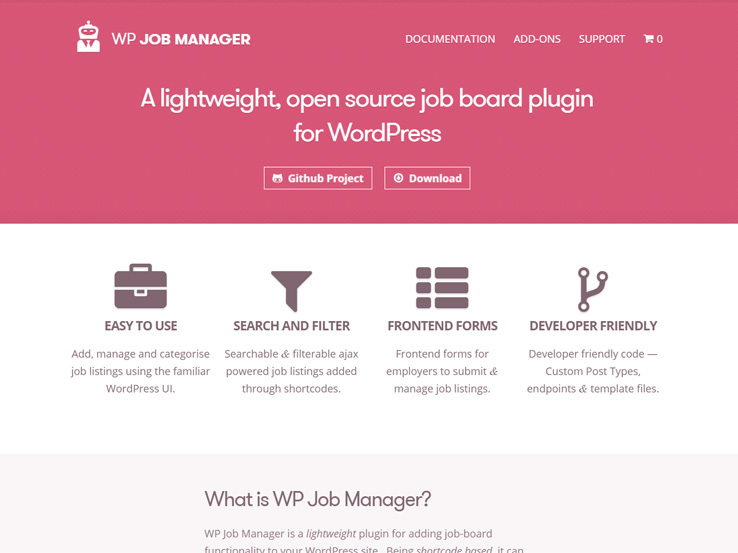 If you’re not keen on switching your theme and just want an easy way to add job listings to your website, then WP Job Manager will do the trick. 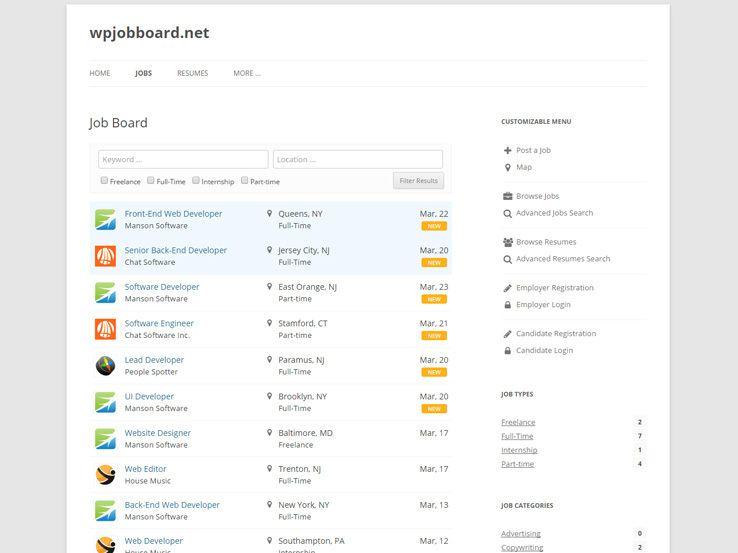 It’s a lightweight plugin for adding job board functionality to your WordPress site. Being shortcode based, it can work with any theme and is really simple to setup. You can easily output individual jobs in various formats, including lists or a job submission form via shortcodes. Logged in users can use the dashboard to view, edit, and delete their job listings. Jobs can be filtered by location, category, job type, and more. There is also an option to subscribe to a category by RSS which allows your visitors to instantly get notified of new job postings. Furthermore, you can allow employers to list jobs on your site from the frontend. They can input job details, including job description and location, and also add details about their company. Each listing can be assigned an email address or a website which job seekers can use to apply to the job. For even more functionality, take advantage of various add-ons available for WP Job Manager such as Location, WC Paid Listings, Resume Manager, and much more. 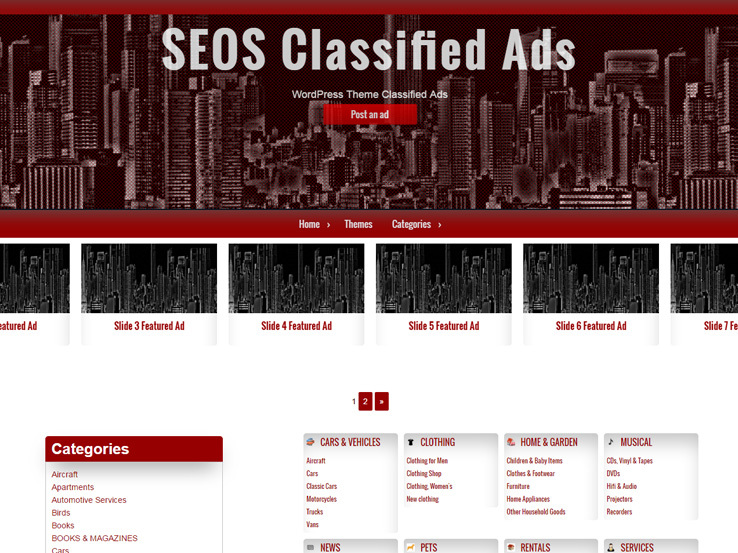 If you want a multi-purpose classifieds theme, then consider Classified Ads. It allows you to create any type of classified site and has a responsive design. Your visitors will be able to see your classifieds no matter which device they’re using. Users can register and submit their own listing. You’ll notice an eye-catching slider which you can use to showcase several of your listings and further down the page you can display classifieds by categories which makes the search for a particular item easier. There is even an option to display a sticky ad at the top of your individual listings to draw attention to a particular ad. Classified Ads comes with theme options panel where you can customize many theme settings such as the ad button text, header image, background image, background color, hover color, header color, nav hover color, footer background color, and sticky post. 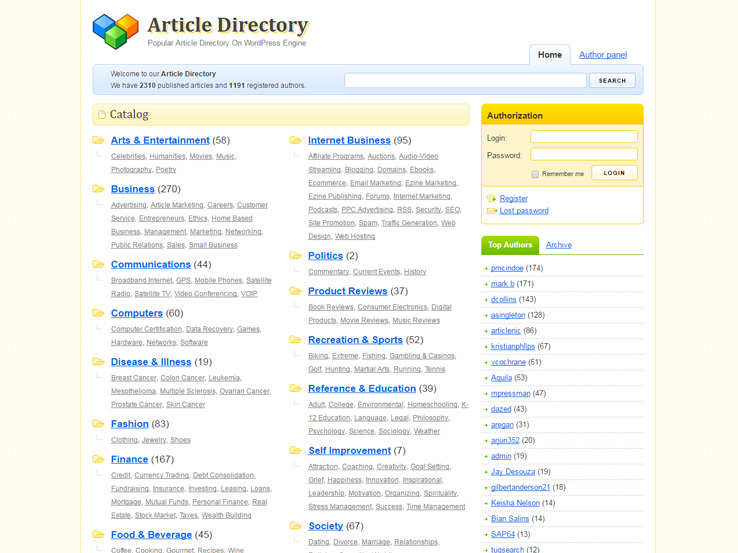 Meet Article Directory, a clean and professional WordPress theme for article directory websites. It comes with in-built analytics, allowing to view the total number of published articles and the number of registered authors, a well-thought homepage layout that includes a list of the most recent articles, and author pages with author details and a list of their articles. On top of that, the template includes breadcrumbs, a related articles function on single article pages, a list of top authors on the sidebar, pagination, and translation files to help you easily change the language of your website. 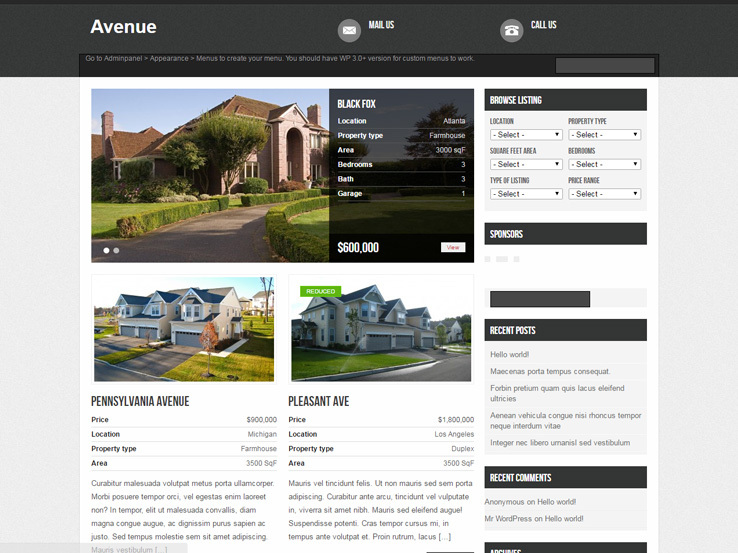 The Avenue WordPress theme is a superb choice for real estate listing sites. Despite being free, it’s packed with lots of top-notch features you’d only imagine on premium directory themes. It comes with a sleek front page slider for showcasing your featured listings, banner ads for generating revenue, and a listing filter that lets users browse listings by location, property type, square feet area, bedrooms, type of listing, and price range. In addition, the template includes a widgetized sidebar for displaying things like your recent posts and comments, banner ads, categories, and more. You can also add your email and phone number in the header section so that people can easily contact you. 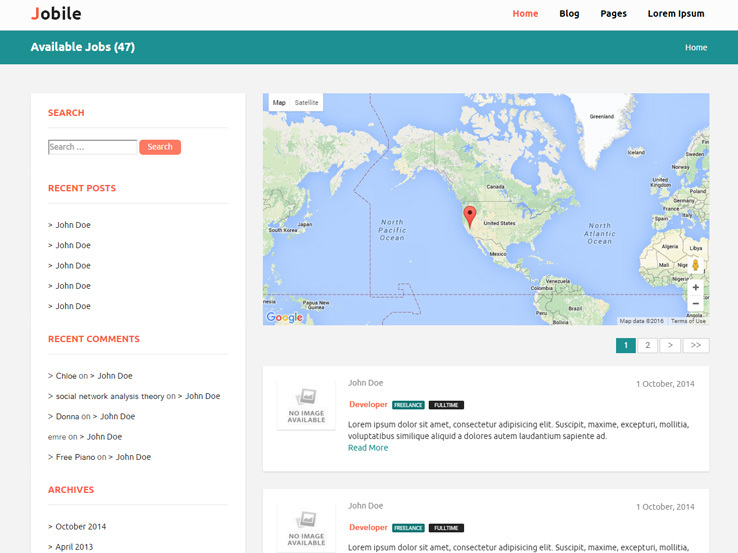 The Jobile theme is a neat, versatile and fast-loading template designed for job listing sites. The front page features a large map to display job locations and then right below it you’ll find your recent job listings complete with thumbnails, date posted, skills, and a snippet of their descriptions. The theme uses lightweight code that is search engine friendly and adheres to WordPress best practices to ensure your website is secure and user-friendly. In addition, the Jobile theme comes with a user-friendly admin panel for controlling your site settings, social icons, and a blog to help you generate more traffic to your directory. Thanks for this useful article. We plan on adding a classified section to our garage door website. We are happy you found this article useful. What theme did you decide on for your Garage door website? We would love to see the finished product. Thank you very much for this help. Glad we could provide you with useful information. Thanks for these wonderful themes! I really like the Jobeleon theme and will give it a try. Yes, for being a free theme, Jobeleon, includes some premium features and designs. I agree it is a very nice theme. Good luck with your new site. It looks like Jobeleon is fully responsive. Let me know your thoughts. i want to make a platform where local farmers can make account as as sellers and list their products in different categories and customers can make account as buyers and buy things. please suggest me a free responsive theme and free plugin for account making. Hi, unfortunately, I wasn’t able to find a free theme that would fulfill your needs. You might want to check out our list of the Best Farming Themes. It might help narrow down the search. Does anyone know of a theme that might help them out? To clarify, are you looking for your website to be more of a directory of services versus selling items? This would make a difference in the type of theme.